How I dress my distaff. ← Who needs bridges, anyway? The following is a photo report (wow, this word makes me think of my youth and those crappy romance photo stories in teen mags) of how I dress my distaff. Please be aware that this is a work in progress and a technique still in development, and that there are probably fifteen gazillion other methods that are at least as suitable as mine, if not better. I start off with my distaff, which is a stick with a few notches cut in at the top to reduce slippage. The notches are a horizontal cut at the bottom, then a sloping cut downwards to meet the notch, resulting in something like a tiny shelf. Attached to the stick is a linen band about 1.5 m long (I used small copper nails to attach it). The band helps to secure the fibre evenly and give the necessary little friction. I start by placing the distaff somewhere suitably flat; a table or the floor will do. 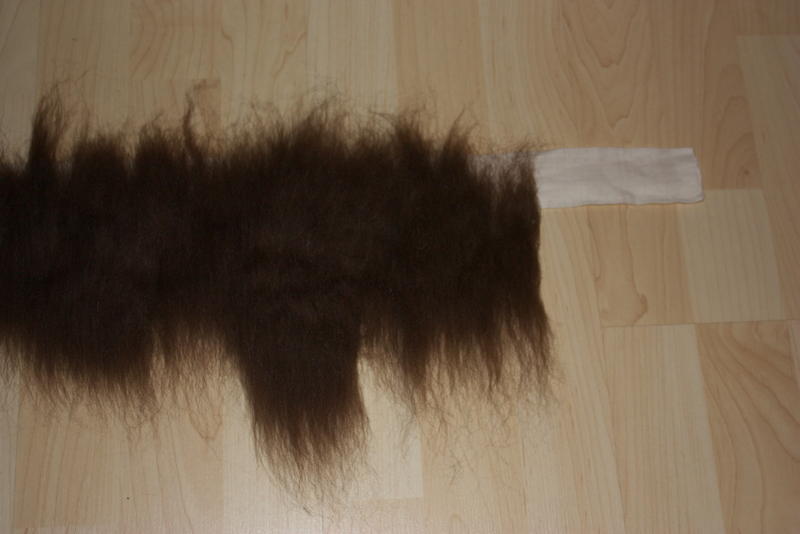 I’ve chosen mixed brown wool for this, about 42 g of it. In my experience, you can use the fibre that sticks out from the bottom of each band and the fibre still touching the band, but usually not the fibre sticking out above the top. So I position my wool accordingly: I place the end of my top at the upper edge of the band, put my hand down on the band and pull the top away, leaving a bit of fibre on the band. I work myself along the band in this way with a first layer of fibre. and then I start rolling up the distaff. Rolling is done with only the gentlest pressure, and without tensioning the band (at most, I put on enough tension to just keep it properly straight). You can roll up with tension, but that may prevent you from drafting out easily – I’ve had more success with going easy on the distaff when rolling it. Roll until you can roll no more, resulting in something like Cousin Itt with a nice headband, and secure the end of the band (I used a modern pin for it here). That’s it. You can go spin now. The band may shift with spinning, developing into a spiral that sort of droops down the distaff. Thus, after a while of spinning, it might be necessary to adjust the distaff – I do that by gently unrolling and re-rolling the band. If you try this method or a similar one, I’d be delighted to hear about your experience! This entry was posted in spinning, textile techniques and tools. Bookmark the permalink. 9 Responses to How I dress my distaff. Is there a savings in total time when using a distaff? (e.g. while dressing the distaff takes time, the spinning part goes enough faster as a result of having done so to make it worth it) Is there an improvement in the quality of the spinning (I am guessing "yes", since I imagine that it would be easier to be consistent as to how much fiber is added per second to the spun yarn). Thanks for this post! It is very clear and educational. 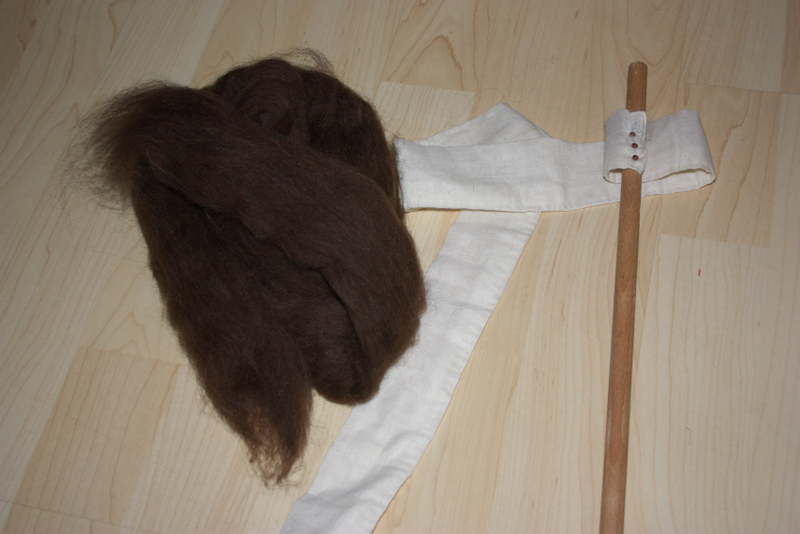 I plan to experiment with spinning someday soon, and I wanted to have a better idea how to use a distaff. 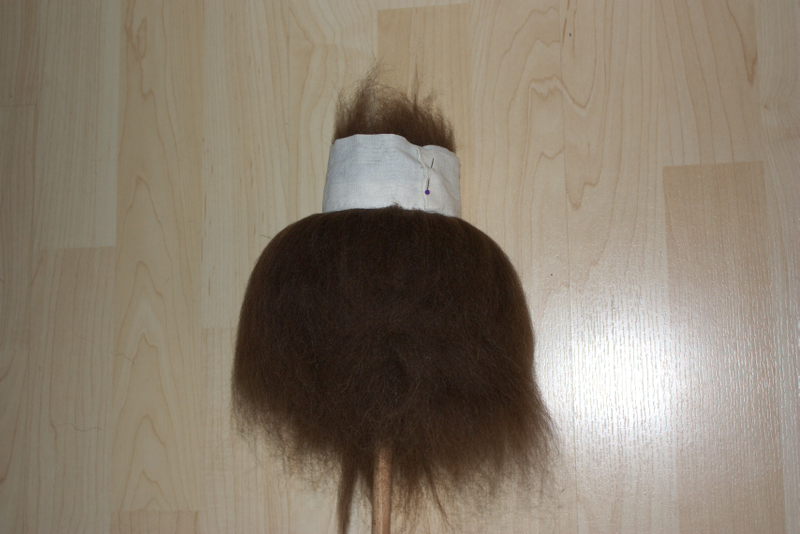 kareina, if you look at the post from two days earlier, you will find an explanation of the spinning technique that goes with the distaff, and also why the distaff is that important for medieval spinning. opusanglicanum, yes of course it depends, I'd dress a Roman hand-held one differently, too (I have had okay success with just winding a slim length of top around it, for example). Sorry if you already addressed this elsewhere – what's your stance on spinning straight from the roving? 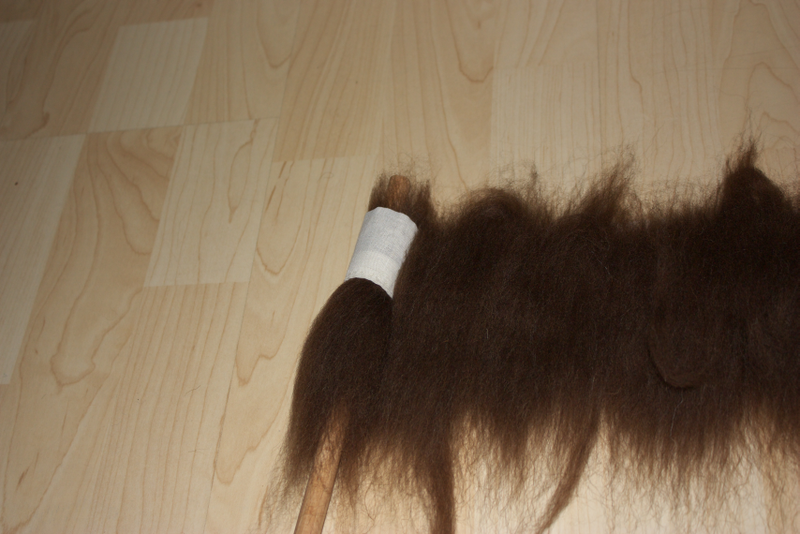 I started spinning with standard merino, and I just wind a continuous length of roving around a broomstick and secure it by tying it over with a band. 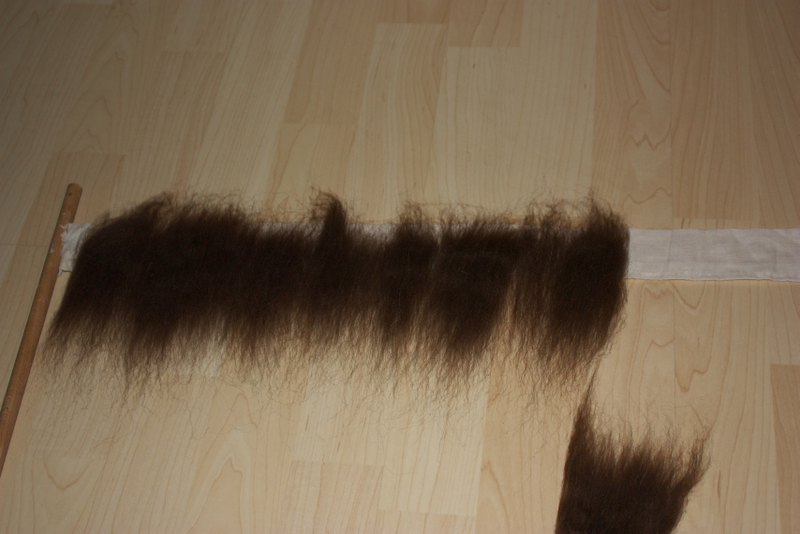 It seems to work well, although I need to rewind or reposition it once in a while to keep the fibers easily draftable. Edralis, that might depend on your spinning technique. With the two-handed drafting technique with fully suspended spindle that is the most common technique with modern hand-spinners, winding roving around a broomstick works well. I tried wound-around-stick dressing with the reconstructed historical technique described in the post two days before this, and it did not work at all for me. Your mileage may vary, though – which technique do you use for spinning? 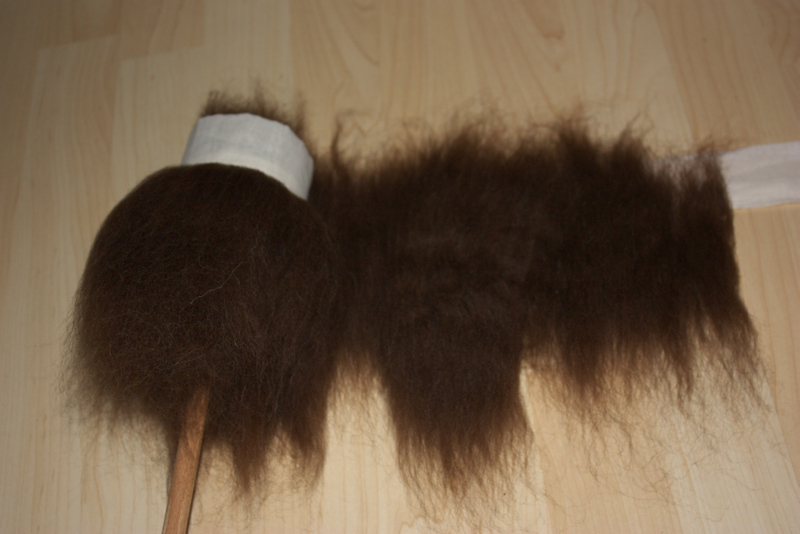 Edralis, try dressing your distaff differently or at least pre-drafting your fibre a little bit to loosen up the fibres. You should not need to draft (as in pull) with the distaff hand – for me, that's the effect of moving the spindle hand, the distaff hand just controls fibre flow and twist insertion. If you need to pull, your fibres are too much sticking to each other. Also it's perfectly normal for yarn to twist up on itself. Anything that does not do that is usually called underspun (even by modern standards). The twist will set over time or through wetting the yarn and letting it dry, and weaving with high-twist yarns like that is possible. For tablet-weaving or sewing, though (or knitting, should you be inclined to that) plying it will be a good idea.